Good day Scrap Shotz Friends! 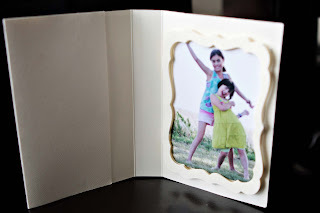 Today I would like to share with you how to recreate my Carnival Make and Take: a Shadow Box Photo Card. Here is the front of the card. 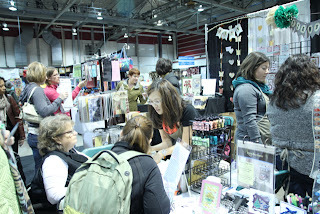 Before I start, let me extend my thanks to everyone who came to the Twoonie Make and Take bar; all monies raised were donated to charity - Thank You! And a Big BIG thank you to everyone who kindly waited in line. I was overwhelmed by your response. As well let me extend my apologies who waited so patiently but I unfortunately ran out of supplies and time! 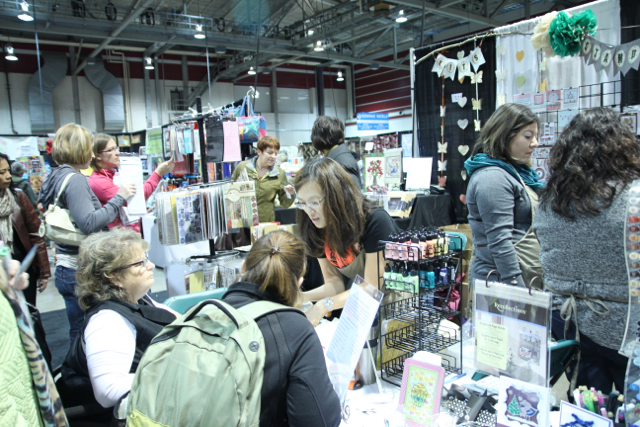 I tried hard to put through 5-7 people at the make and take table at a time. 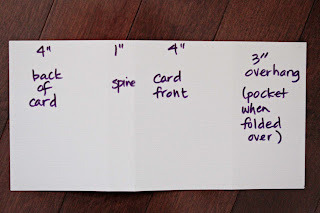 First, cut a 6"x12" piece of sturdy cardstock (ie. Bazzill works wonderfully); this is the card base. Score the cardstock at 4", 5" and 9" with your Scor-Pal or Scor-Buddy; this leaves a 3" overhang which folds over into a pocket to house your Christmas newsletter or a special note to the recipient. Refer to the image below. Cut a 0.75" x 5.75" piece of pattern paper. Using a light hand, apply liquid chalk using the adorable Prima coloured liquid chalks and set aside. 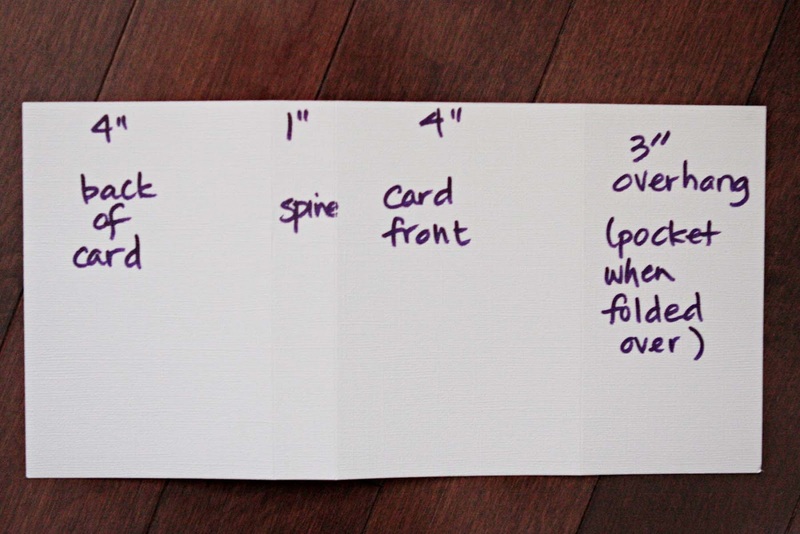 Cut a 4"x6" coordinating piece of pattern paper for the card front. Using a light hand, apply liquid chalk using the Prima coloured liquid chalks and set aside. Next transfer the positive Elizabeth Craft Design sticker onto a sized piece of Sookwang tape. What works the best for me is to gently roll the entire sticker sheet until the positive edge of the sticker image pops up. 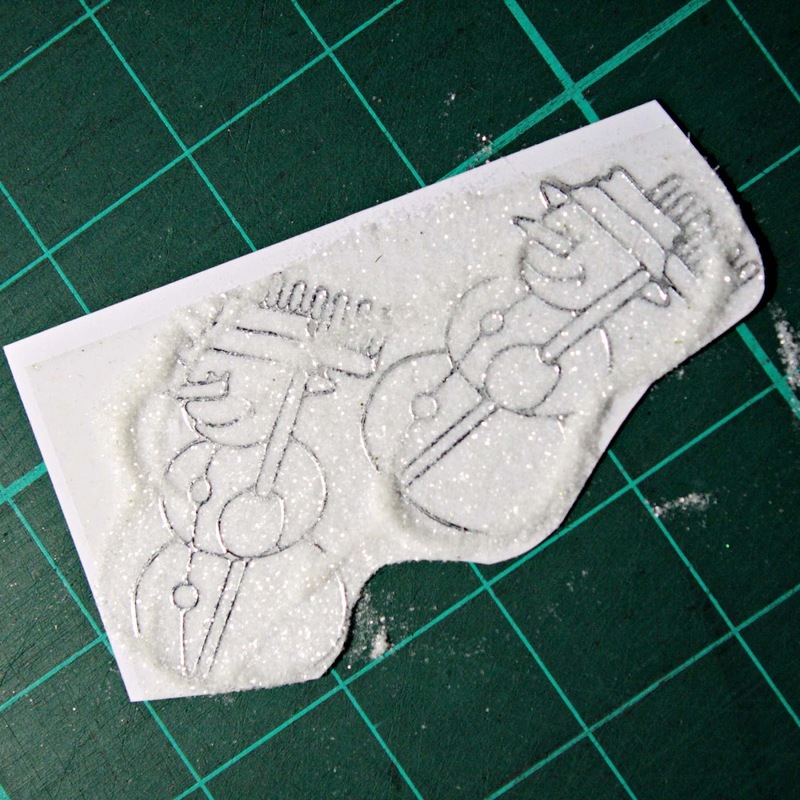 Using a pair of tweezers, I slowly peel pack the positive sticker image. As I am right handed, the tweezer - positive sticker image combo is held in my right hand and my left index finger is "supporting" not holding the bottom of the sticker. I move the sticker over top of the Sookwang tape, gently remove my left supporting index finger and release my tweezers. The positive sticker image then flutters gently onto the tape - no bubbles, no wrinkles and for me, no tears! As you can see from the image below, the positive images have been removed from the sticker sheet. 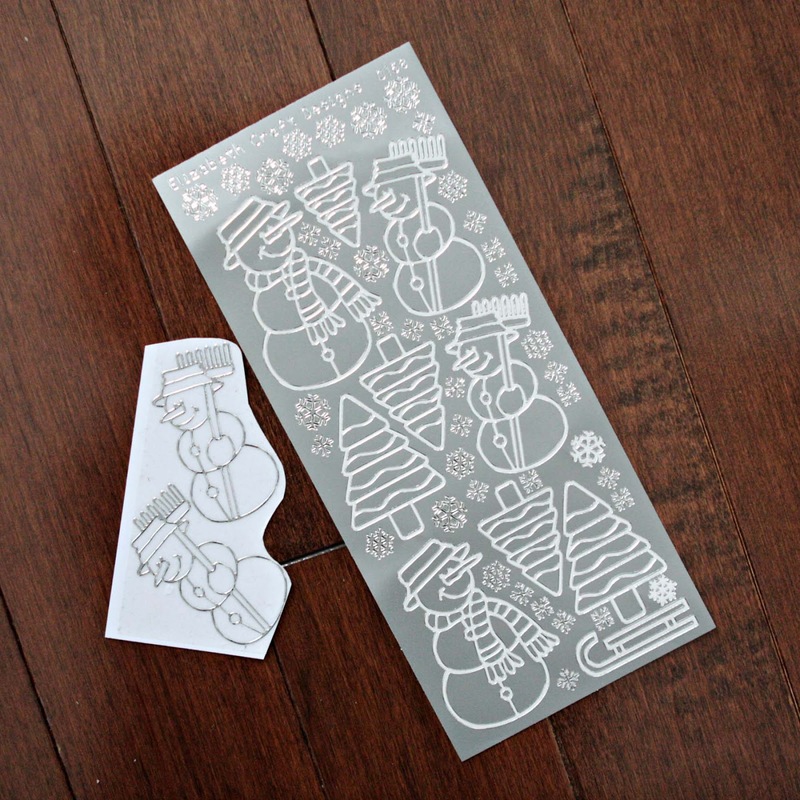 On the Sookwang tape is the positive image of 2 snowmen. Then apply the Glitter Ritz. 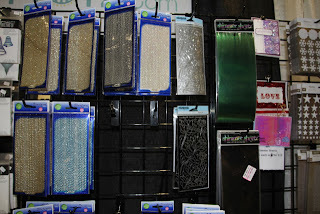 This is glitter is micro ultra fine and is different from that of the ultra fine glitter offered by other manufacturers. It's properties allow you to colour the glitter with copics, stain it with Clearsnap Smooch and/or Ranger alcohol inks or draw on its surface with a Copics multi-liner pen. Using your finger, burnish the glitter into the adhesive to (1) enhance and encourage the glitter sparkle and (2) reinforce the adhesive to the glitter. Then return the excess glitter to its container. A little goes a very long way. I did not even use 1/2 of a container after spending 2 days at the Carnival for the make and take and booth demonstrations! Fussy cut the image and decorate as desired. 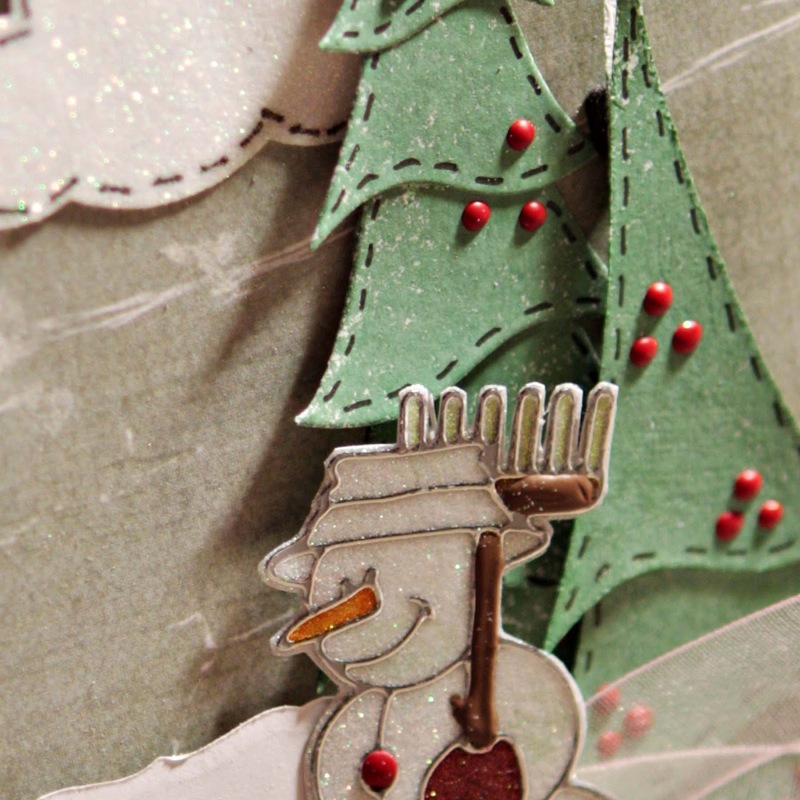 I used the Clearsnap Smooch for the snowman's nose, coloured mitten with a Copics pen, coloured the broom fronds with a Copics Spica pen and covered the buttons and broomstick with Claudine Hellmuth acrylic paint. 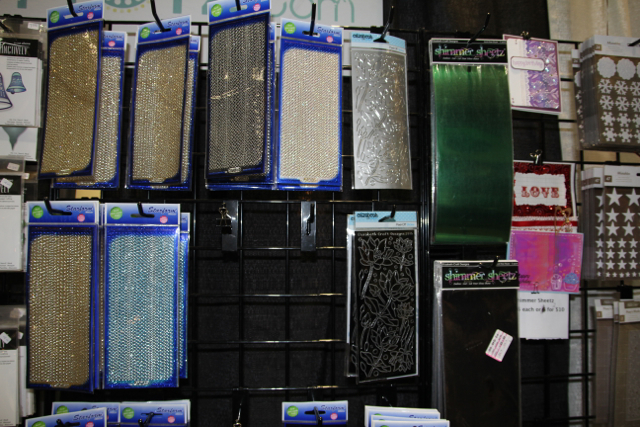 All items can be found in the Scrap Shotz store. 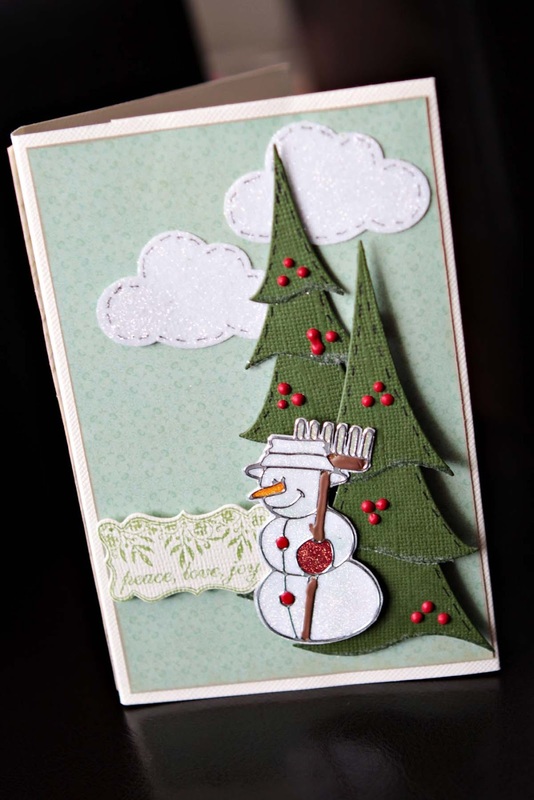 Using Dee's Distinctively Dies, cut 2 sets of Christmas trees. If desired, apply a very thin bead of glue (I used the Tsukineko Essential Glue Pad) along the bottom edge of the tree parts and dip into the Glitter Ritz to create the appearance of snow on the tree. Assemble the tree parts from largest to smallest. 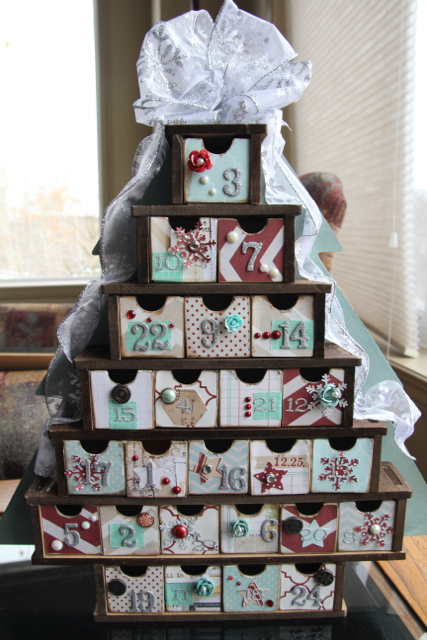 In my sample, there are 2 different sized trees; this is done by using either less or more of the die cut tree pieces. Using the Copics multi-liner pen, draw a dotted line around the tree pieces to create the illusion of stitching. The "stitching" adds a real charm to the images. Set trees aside. Below is a close-up of the trees. 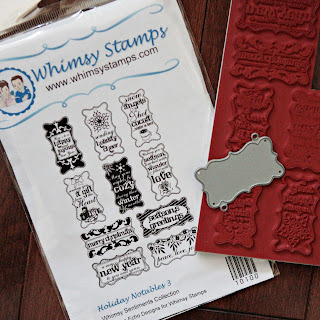 Using the Whimsy stamp and matching die, stamp your sentiment onto a piece of coordinating cardstock. I used Memento ink because I am in serious love with the even ink on the image and the juiciness of the ink pad despite frequent use. 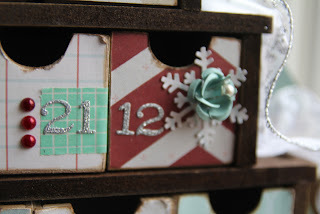 Then use the matching Whimsy die to cut the sentiment. Please note that the Whimsy Stamp and Die set has a unique and very accurate cutting system. This will be explained in a subsequent blog post/tutorial as the focus of this post is to recreate the Carnival Make and Take. 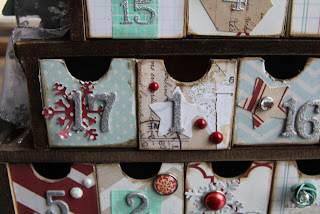 Set aside the stamped and now die cut sentiment. 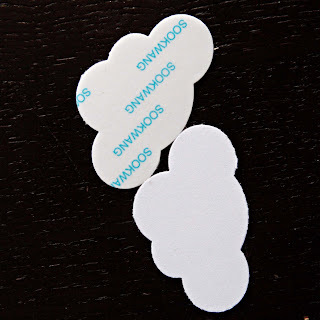 There is such versatility in the Sookwang adhesive and Glitter Ritz - here I layered white cardstock on top of the Sookwang tape. Then I used my Fiskars cloud punch and punched 2 cloud shapes. 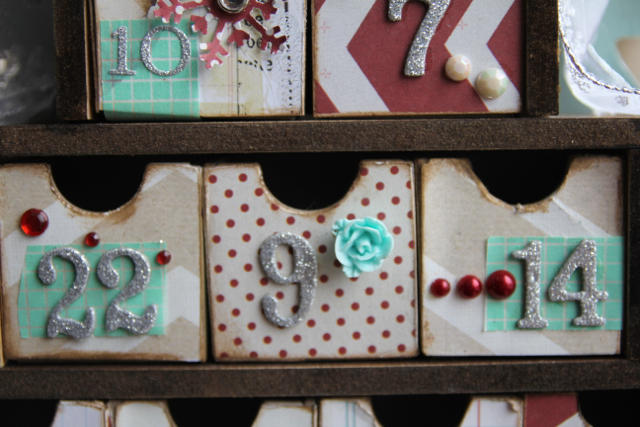 Remove the tape backing, apply and burnish the Glitter Ritz to the cloud. Similar to the die cut Christmas trees, use the Copics multi-liner pen to "stitch" around the cloud. Set aside the glittered cloud shapes. Using 2 Spellbinders Labels17 dies, die cut 2 frames for the inserted photo. Please note that a subsequent blog post will be show how to die cut the frames using 2 or more dies to keep the focus on the creation of the Carnival Make and Take. Set aside the 2 frames. Adhere the cut and inked pattern pieces to the spine and front of the card. Then glue the top and bottom edges of the 3" overhang to create a pocket. Now adhere the trees, staggering one in front of the other. My sample has the smaller tree raised using pop dots. Add the glittered and decorated snowman; again, I used pop dots on the snowman. 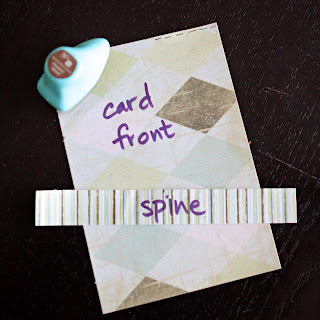 Adhere the die cut sentiment. Adhere the glittered and "stitched" clouds. Then layer the photo frames, with one frame pop dotted on top of the bottom frame. Adhere 3 sides of the photo frame to the inside of the card. Trim and insert your photo. Lastly, using the Claudine Hellmuth acrylic paint, add ornament (ie. balls) to the tree, buttons on the snowman and the broom stick. Let dry thoroughly; it takes between 10 and 15 minutes to dry. 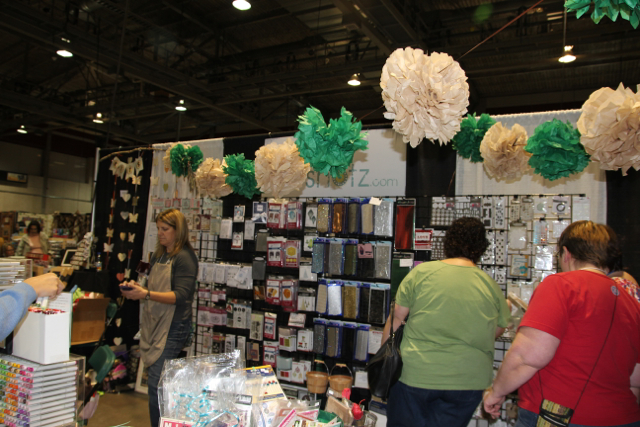 The Elizabeth Craft Designs products, new to Scrap Shotz, literally flew off the tables, shelves and bins at the Carnival. Elizabeth (we're on first name basis ;-) ) has made beauty and elegance easy, quick and most importantly stunning! 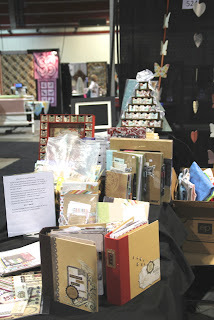 Check out these beautiful items created by Carolyn Waldschmidt. 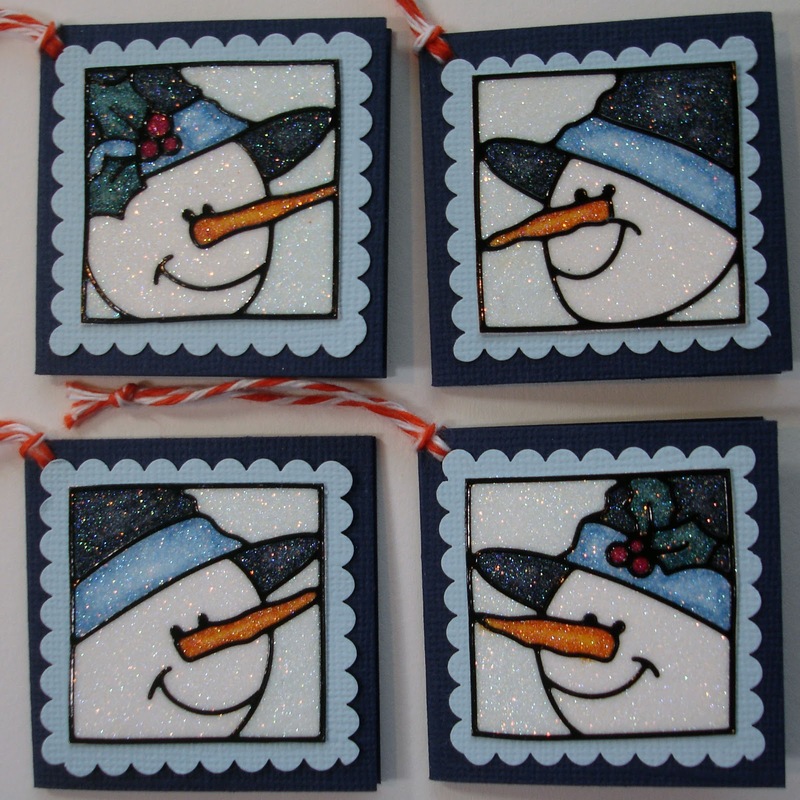 These snowman tags are so sweet. 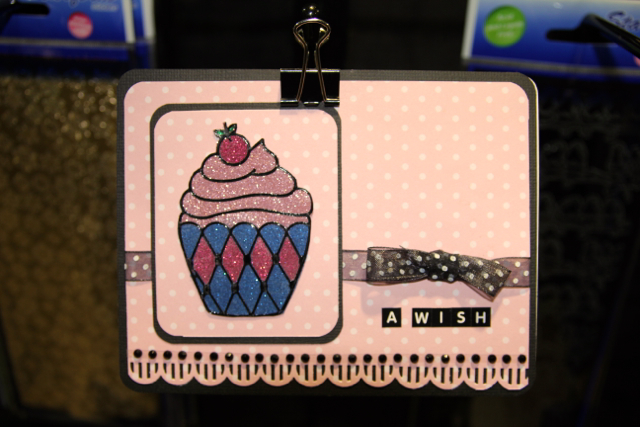 And this cupcake card is a stunner! Yes, these snowmen and cupcake has been covered in micro ultra fine glitter; aren't the colours divine? This stunning Kaisercraft Advent Calendar created by Rosie Neustaedter received lots and lots of oohs and aaahs at the Carnival. Here are a few close-ups of the advent calendar. Look at all the special details Rosie added - absolutely beautiful! Rosie used the MME All is Bright paper line. A perennial favorite at the show are the advent calendars - can you see the Kaisercraft tree stunner that Rosie made? And our Simple Stories snap albums drew lots of attention too! Stay tuned for some more photos this week! I am SO darn excited to share this news with everyone! Scrap Shotz has been sleuthing the scrappy crafting world and you how Sandy strives to have the latest and greatest in the store and available to you and me....well.....let me introduce you to some wonderful Elizabeth Craft Design products! Let me just say that you can make STUNNING projects in minutes; you can use your copics to colour the glittered images as well as the Spica pens too! And don't let me forget, you can use the new Claudine Hellmutt paints, Clearsnap Smooch, Ranger Distress Inks and markers...and oh so much more! At the upcoming Carnival to be held on October 19 and 20th, I will be demo'ing these products and a few other new products. 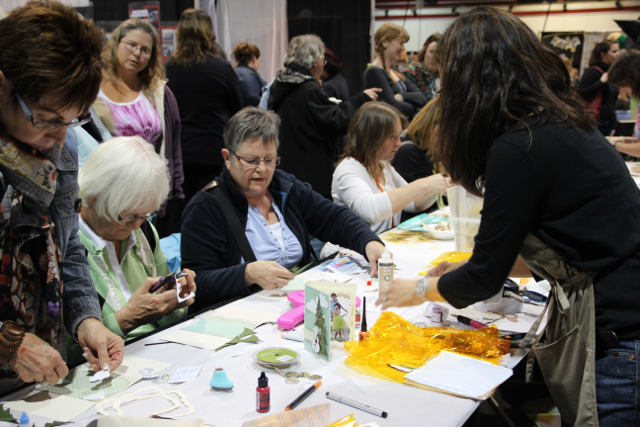 Join me in the booth for a 1-1 technique sharing and support a local charity by attending my Twoonie make n take - a Shadow Box Card. 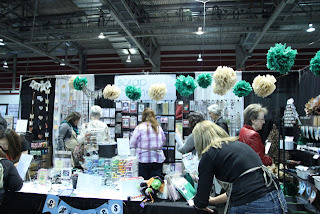 I hope to see you at the Carnival...and check the blog for upcoming posts on all the new products!